The trails of Boise don’t always lead to the mountains. In fact, if you hit the roads heading west past Caldwell and cut off at Exit 26 to US 20/26, you’ll find an expanse of farmland as far as the eye can see. It’s a beautiful drive, especially at sunset; and the road will lead you not just to heartland of Western Idaho, but back in time as well. The Parma Motor-Vu sits in a field that time, seemingly, forgot. The neon sign blazing against the setting sun gives an ethereal edge to the pullout leading to the ticket gates. And the hot, shimmering heat against the highway gives an illusion of driving through a time vortex as you pull into your place in line. Yet the marquis assures you that you’re still firmly planted in the twenty-first century – you can tell by its pronouncement of A-list features and that digital projection has arrived. Somehow the magic isn’t diminished by the fact that convertibles and bobbysoxers have been replaced by pick-up trucks and families. In fact, somehow, it adds to the timeless moment you’ve entered. Perhaps it’s the air of excitement that surrounds the encroaching nightfall, or the wafting smell of buttered popcorn and hotdogs. Or, just maybe, it’s knowing that this American icon is still holding its own, a tradition passed from one generation to the next. On July 20, the Parma Motor-Vu will be celebrating its 60th anniversary. Over that time, owner Karen Dobbs has seen it all. And that’s not counting the movies. First opened by her parents in 1953, Karen has witnessed firsthand the ups and downs of the ultimate cinema icon. From the halcyon days of the 1950s through the slump of the 80s and finally the nostalgia-inspired revival of the drive-in’s seen today. But, for all the change the Parma Motor-Vu has seen, one thing remains the same – the popcorn. “This is the original popcorn maker we’ve had since we opened,” bragged Dobbs affectionately, as she scooped and buttered her way through our chat. And indeed, the cast iron popper sparkles under the lights of the concession stands and the lines are long, as folks know this is, without a doubt, the best popcorn around. So if you’re ready to hit the trail and take in the stars, rest assured that the Parma Motor-Vu is worth the trek. Be certain to pack your favorite chairs and blankets, and know that the sound is now broadcast on 105.5 and not over the crackling speakers of yesteryear. You’ll want your bug spray too, and don’t you forget it. But as the credits start to roll and you notice a fingernail moon hanging in the sky just above the screen, you’ll find yourself feeling the true movie magic of the Parma Motor-Vu. 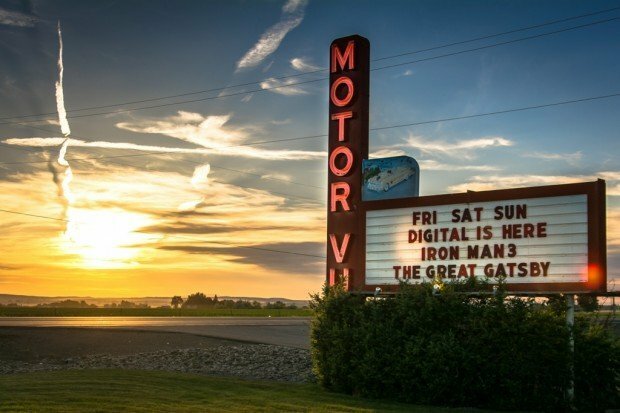 For information on what’s playing at the Parma Motor-Vu, and to find more information on the upcoming 60th anniversary celebration visit www.parmamotorvu.com or find their virtual marquis on Facebook.